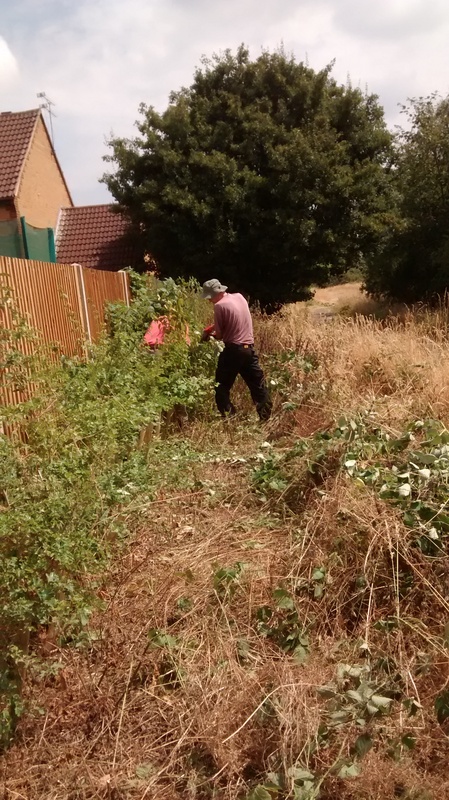 On Thursday 12 July I was joined by Paul, Mike, Eric, Matt and Ed at Chalk Farm, Wellesley Woodlands to cut back the paths and remove brambles from around the saplings planted roughly 4 years ago. Matt, Ed and Mike took strimmers and hedge cutters out to head round the long circular path. They were cutting around posts and fences, as well as siding up the edges so that when Stu joined us in the afternoon with the Kubota he had a clear edge to now down. Meanwhile Paul and Eric tackled the saplings running along the northern edge of the site, nearly disappearing it had gotten so overgrown. 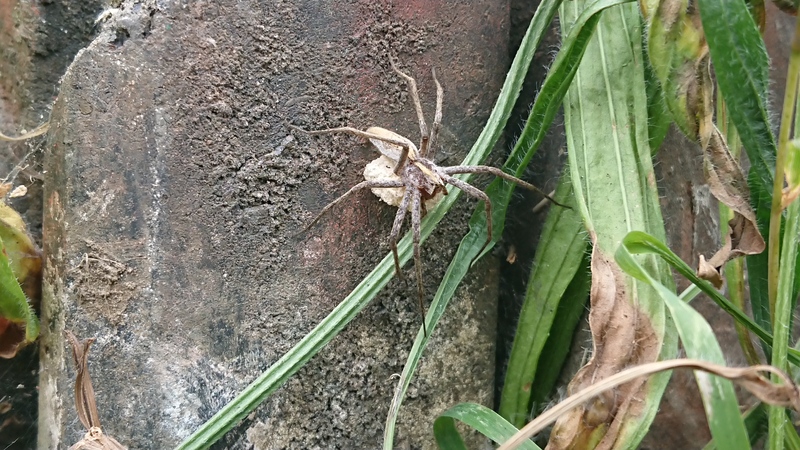 This is a Nursery Web Spider – Pisaura mirabilis. Under her body you can see her carefully wrapped eggs which she is carrying in her jaws. She will be looking for a safe place to put them so she can guard then until all the spiderlings hatch. I carefully put her to one side to carry on her way. Thank you to everyone who joined me in the heat. Whilst it’s not as hot as last week, it’s still enough that physical work is very draining and we accomplished everything I had hoped we could. This entry was posted in Access, Conservation, Education, Volunteers, Wellesley Woodlands, Wildlife and tagged chalk farm lake, Path Cutting, Spiders, Wellesley Woodlands. Bookmark the permalink.